Today, the 21st of Feb 2019 is the launch of KazuByte (KBYTE). YOUR KAZU MICRO COIN IS HERE!!! 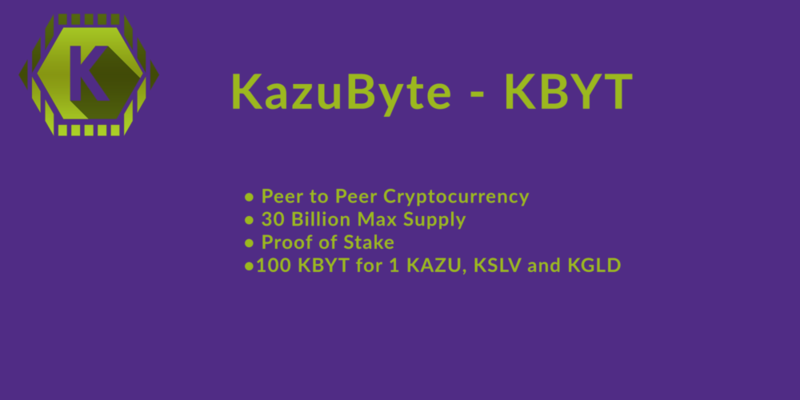 We would like to introduce you first to the KBYTE wallet by heading over to https://www.kazucoin.io/kazubyte and downloading your Windows or Mac Desktop client. Please download this and sync. You have probably noticed that we have abbreviated to KBYTE instead of KBYT. Sorry for any confusion but for internal reasons it will be staying as KBYTE. Now you are all wondering about your coins. We are still in the process of working out a distribution plan due to unforseen factors. We are hoping that one of our exchanges will greatfully help us out. Otherwise we will need to distribute manually. This will obviously be a painfully hard job. But we will find away. Especially for those who do not have the option of a desktop wallet. We have been asked whether we will be carrying out the KBYT fork........ of course we will! The only discrepancy is the date. For now we are keeping with the 21st of February. But please be patient if it is put back. This is due to changes out of our control. As of right now KBYT will NOT be listed on Altilly.com please do not ask them about the fork as they have enough to deal with. Also we would like to announce a quick update on eligibility. We are now going to expand entrance point for the fork. So if you hold KAZU, KSLV and KGLD it will be 1:100 on all balances. If you only hold 1 of these coins it is fine too.